Hello. I am the proud owner of a WWII footlocker. A couple of years ago I lost the key and the footlocker is locked. Any ideas about how to get a replacement key? I dropped it off at a local locksmith a few years back and they were unable to make a new key. Should I try a different locksmith or is there a better route? Could you possibly post a picture of the lock? I have a good friend who is a locksmith, and he might be able to give you some advice. I will take a picture tonight. My buddy (the locksmith) said it is a standard trunk lock. He said the key would have to be hand filed. He suggests you call around to a few locksmiths and see if one would take on the project, unless you wanted to take a road trip to central Wisconsin. Thanks Bear! I will give it a shot. Bear, I also have a lock with no key. Did you have any luck with making your own key? 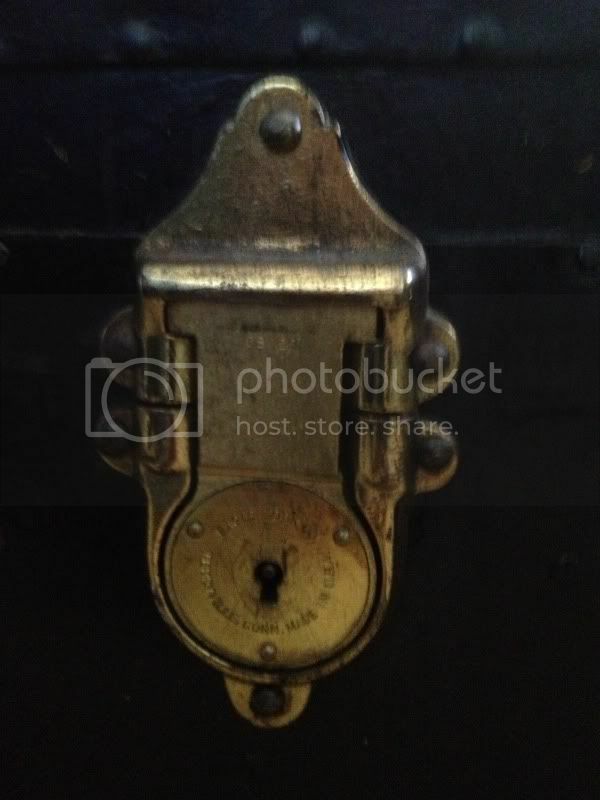 drop the guy a note with the size/type lock with some good, detailed photos and see if he might have your size. Good luck and let us know how you do. I've opened a few of these in the past. The key actually moves the latching mechanism, rather than just locking it, so you aren't 'picking' the lock as much as making a new handle. With a little luck and patience, you should be able to turn the latching disk, while missing any wards. Use the center pin as a fulcrum to turn the disk. A little dash of penetrating oil before starting is a help as well. I have what looks to be the exact same chest, but it never had a lock! 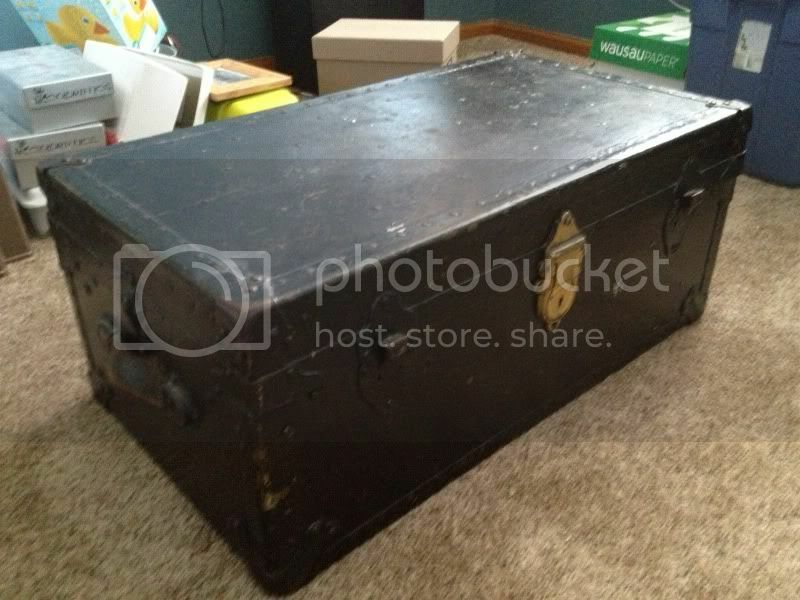 It has markings as a military medical chest. I do not know if you have already given up or still have this problem while googling trunk parts this listing came up. 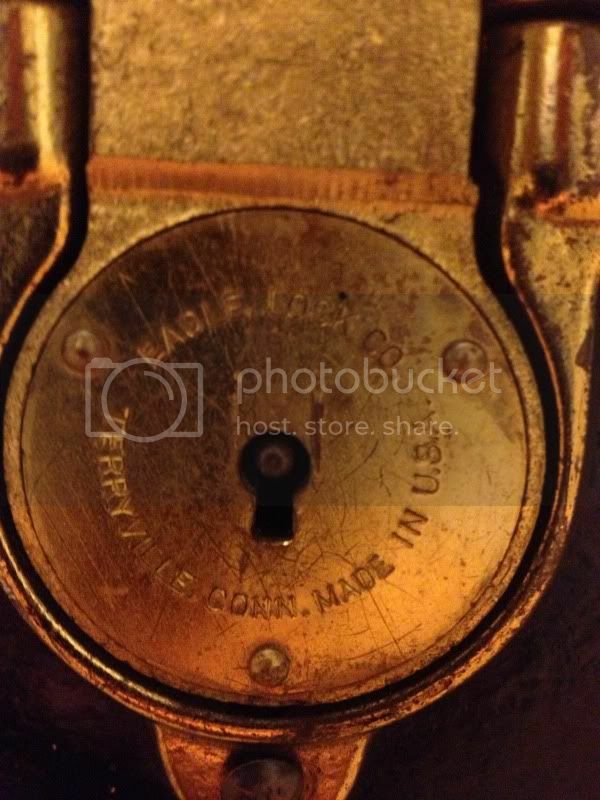 The key for this lock is a hollow barrel type key. I could not read the number on the lock it starts with the OB then three numbers the first number should be a one then two more numbers this is the key code. the keys for this lock can be found on ebay. They also can be found at Brettun's village trunk shop website in Maine and Island trunk shop web site in Boston.